I met Jessica when we were both working at Louisville Visual Art— she was (and obviously still is) smart, passionate, fierce, funny, and the list could go on and on. 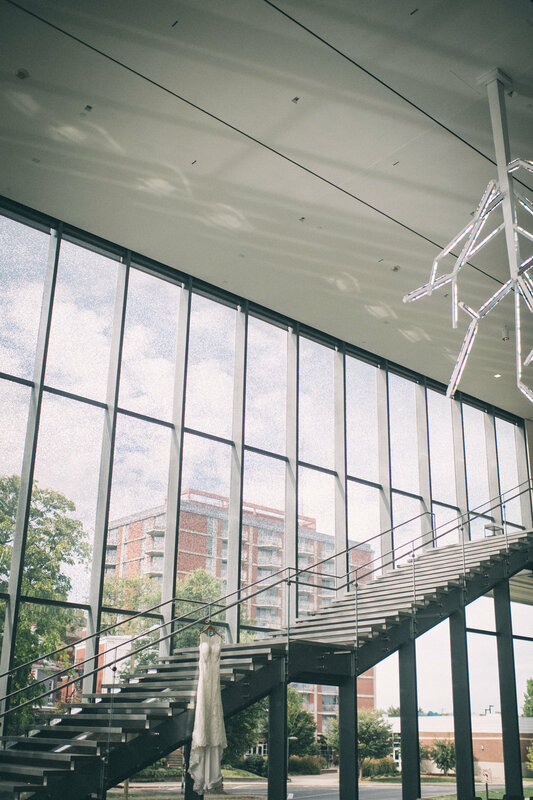 It seemed like such a perfect fit when she chose The Speed Art Museum as her wedding venue since art has played such an important part in her life. The whole day felt effortlessly modern and she made an incredibly gorgeous bride. When I first met Ethan it was obvious that he was the perfect partner for her— he is just as hilarious and intelligent as she is and they compliment each other so well. They both did an amazing job balancing their fun, quirky ideas with clean and modern aesthetics. They even took on the task of some pretty serious DIY projects— namely making and bottling cold brew coffee as favors for their guests as well as creating the stained glass table numbers for the reception. I really enjoyed the temporary tattoos they had for everyone as well as some his & her golden dinosaurs for the cake. I love when weddings highlight a couple's goofy side, but it's even more impressive when it is done in such a fun and gorgeous way. Admittedly, my favorite part of the night was getting to sit down with my spouse for dinner surrounded by some of my favorite people from my time working at LVA. It isn't often that I get to actually experience what it's like being a guest at a wedding and it was such a magical, special thing. Getting to have Bobby there also allowed me to pass off my third camera during Jessica's entrance so I could have a side shot of her entering on the stairs (thanks hon!) while also capturing Ethan's face as he saw her for the first time. It ended up being one of my favorite images from the day! If you are wanting to see some more unique venues, I loved getting to photograph these weddings at Yew Dell Botanical Garden, The Santa Barbara Museum of Natural History, The Fox House Nashville, and Lost River Cave. Jessica & Ethan’s wedding was featured in Louisville Bride.